As a kid growing up I always dreamed of owning an inground swimming pool. I grew up with an above ground pool that was great fun, but not nearly as awesome as an inground pool. After recently completing our own inground pool in our backyard I wanted to share my thoughts and the knowledge I’ve gained on this topic in hopes that it will better inform those of you considering a new pool. Gunite Pools – Gunite pools are by far the most durable, most expensive, and allow for endless designs. These pools are built by creating a matrix of reinforcing steel inside of an open excavation and then spraying concrete to form the walls of the pool. The shape and size of gunite pools are really only limited by your creativity. Gunite pools have the highest maintenance cost due to resurfacing and retiling the pool every 10-20 years. Gunite pools also have a porous surface that requires additional chemicals to combat algae and the surface roughness can be bothersome to some users. Vinyl Liner Pools – Everyone knows about vinyl liners for above ground pools but I’ll be the first to admit I didn’t realize they are regularly used for inground pools as well. 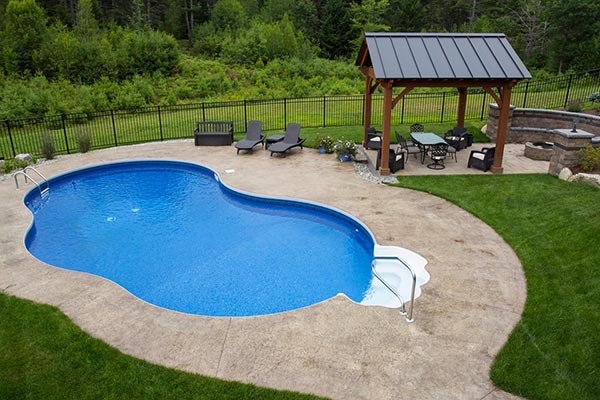 An inground vinyl liner pool is a bit of a hybrid that uses a combination of steel wall panels and gunite or vermiculite to form the sidewalls, and a vinyl liner to hold in the water. Vinyl liner pools offer lots of shapes and sizes along with a huge selection of liner patterns and colors. The vinyl liner typically will need to be replaced every 7-15 years. However, the smooth surface of the liner is typically more pleasing to users compared to a gunite pool surface. The smooth surface does not promote algae growth and typically is easier to maintain than a gunite pool. Fiberglass Pools – Another common inground swimming pool option is a fiberglass pool. Fiberglass pools are the quickest to install and offer the lowest maintenance costs of all the pools listed above. Fiberglass pools are typically limited to approximately 16′ wide and must be small enough to truck to the site in one piece.